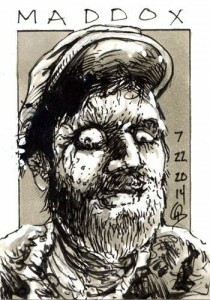 Today’s daily warm-up sketch card from artist Todd Beistel is me! If you haven’t checked out his art, you should treat yourself and check it out (www,beisteldesign.com). And if you really want to see some great work from Todd, check out his work on our book The Horror Show. I’m really lucky to have teamed up with Todd, and I gotta say, this is just the latest piece of art in a long list of art from him to make me smile. Thanks, Todd! This entry was posted in The Horror Show. Bookmark the permalink.